Since tomorrow we'll be having another one of those practice democracy drills here in California, I thought I'd put together a few bar charts. There are five propositions on tomorrow's ballot. In researching them, Lena came across the Cal-Access Campaign Finance Activity: Propositions & Ballot Measures. Unfortunately, for each proposition, you have to click through each committee to get the details for the amount of money they've raised and spent. Here's a run-down in visual form, the only data manipulation I did was round to the nearest dollar. Note: no committees formed to support or oppose Proposition 13. It could just be my perception of things, but I get pretty suspicious when there's a ton of money involved in politics, especially when it's this lopsided. The only thing I have to add is you should Vote "YES" on Prop 15, because Larry Lessig says so, and so do the Alameda County Greens! Update #1: Let me write it out in text, so that the search engines have an easier time finding this. 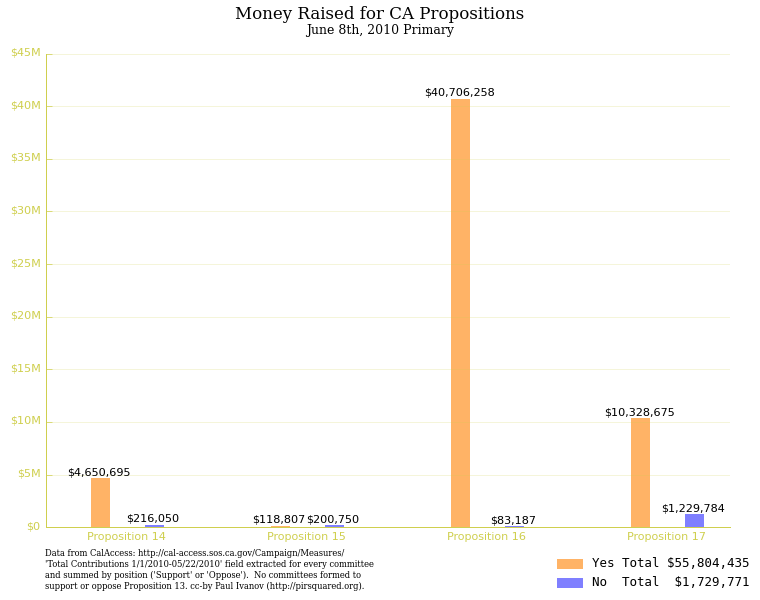 According to the official record from Cal-Access (Secretary of State), as of May 22nd, 2010, there were $54.4 million spent in support of various propositions, most notably $40.5 million on Prop 16, $8.9 million on Prop 17, and $4.6 million on Prop 14. Compare that with a "grand" total of less than $1.2 million spent to oppose them, with a trivial $78 thousand (!!) 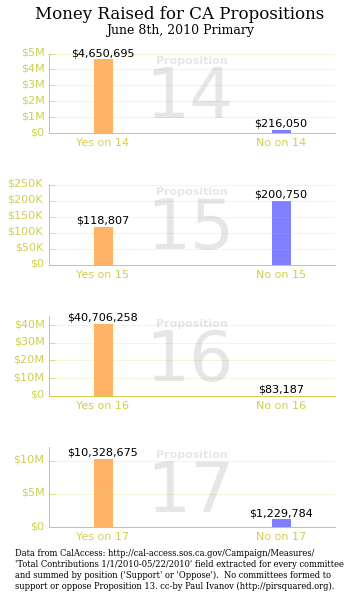 to oppose Prop 16's $40.5 million deep pockets. 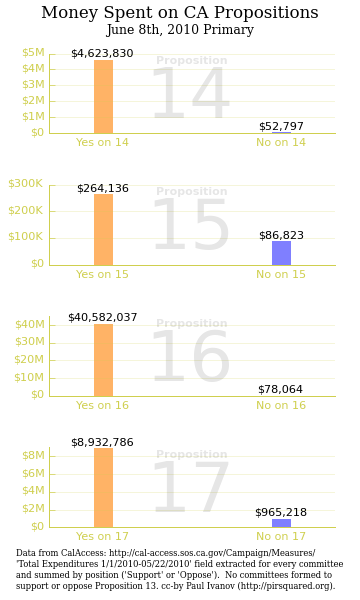 Update #2: The California Voter Foundation included more recent totals (they don't seem to be that different), as well as a listing of the top 5 donors for each side of a proposition in their Online Voter Guide.